Roofing companies who have invested in an official website have likely been faced with the task of search engine optimization. While some SEO techniques like keyword research, and NAP citations are common knowledge, others are less talked and written about. Roofing companies can take advantage of these “hidden SEO” techniques and take their online presence to the next level in 2018. Most websites that earn featured snippets already rank in the top 10 for the given search query and / or keyword. That’s why step 3 is so important. Your entire website must be optimized — not just the section you are trying to earn a snippet for. Regardless of which, featured snippets present a new opportunity to rank #1 on Google. Want to take advantage of the hidden SEO in your market? Roofing Webmasters can help you get there. With our internet marketing services, we can give you the edge over competitors. In addition to the obvious optimization techniques like keyword placement, and on-page SEO, we also pay attention to every last detail, from Image optimization to schema markup. Our design team works collaboratively with our content team to form the ultimate marketing solution for roofers. You might be sick of promises made to you by various marketing companies. They might promise an abundance of traffic that turns out to be empty (doesn’t lead to conversions). They might promise an increase in metrics (click-through rate) that once again don’t lead to conversions. The best way to ensure good marketing services is to demand accountability. That’s what is done at Roofing Webmasters with our month-to-month agreements. You are never locked in long-term, so we are constantly evaluated and held accountable. 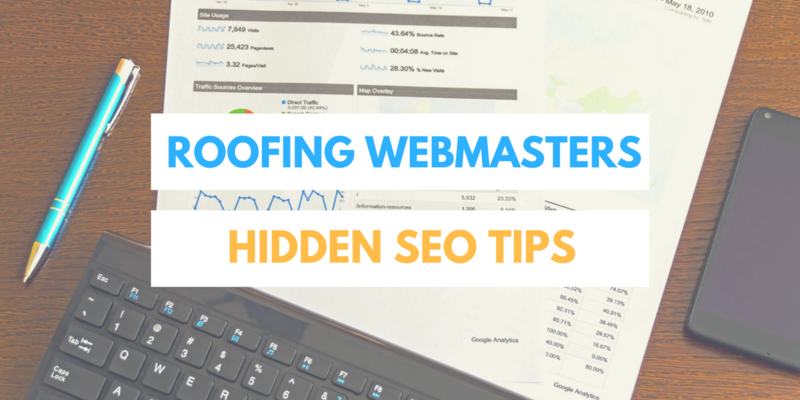 Call (800) 353-5758 for more hidden SEO tips for roofers.